The earth is 4.54 billion years old and the population is growing. I think that cremation is better than burial coz it takes a lot of space. Have you guys heard of cremated ashes used as a fertilizer to grow a tree?I think it serves a better purpose than a coffin. for myself? Burn me or whatever. I don‘t care. We‘re all just stardust and we never really die. We just lose the chaining of our atoms. All of them just fuse with something else. Maybe a dog, maybe a new sun, maybe just a trashcan. 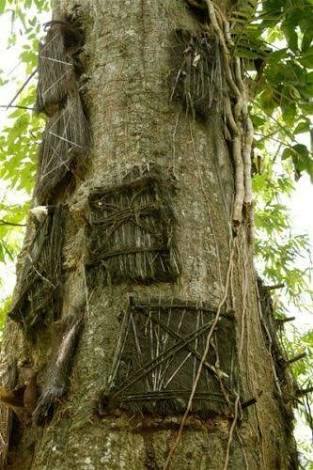 In the past when coffins are not yet a thing, people here plant a tree over the corpse. I forgot the name of the tree but it usually appears in local horror stories cuz it symbolizes "dead body buried here"
Soon they will be putting coffins on top of coffins all over, as some cemetaries are already doing near me. You buy the plot but then never tell you that the space above you can be sold. I believe in the UK they are aready doing a 4 stack system. Creamation and spread them by the ocean. you only pay for the available space, and the next person will pay for the available space, and cremation is crippy,you cremate a cadaver and spread the ashes on the ocean for fishes to feed on,you then go fishing for those fish for consumption. I didnt think about this. But yeah thats creepy. Shouldn't have read this. I won't be eating fish for weeks now til i get over this! and everything that has fallen into the ocean and decomposed? how about fertilizer, sewerage, chemical run offs? Guess that never bothered you before.. When your turned to ash any disease you had dies, it poses no threat doesn't need to be sealed in a box burried 6 feet under. Fact all thats left is minerals, minerals that are essential to the Earth. mistletoe that's real creepy. for now i will stop eating fish and meat,time to go vegetarian! Though yeah, if you bury a corpse in a soil, plants will grow, then you eat the plants. Going back to topic, my country is not against cremation. Though my religion is against to it before, however today, it's accepted. Though im not sure why this was invented on the first place? But the reason i could think is that to simplify the decomposition of a loved one . what are those on that tree? dont tell me ashes!